Chris was born and educated in Poland where he achieved a high level of education and a degree in motor engineering. His first steps in the motor industry were big, ambitious ones. In 2004, Chris moved to the USA where he worked as a master technician with Audi, VW and Porsche vehicles. During his time time in North America, he gained vast experience and knowledge in diagnostic and identifying complicated technical issues – usually problems that other establishments had difficulty resolving. To advance his career in 2006, Chris stayed in the USA and joined the World VW Dealership. This was where he started his factory training with VW, as well as sharing the knowledge he’d acquired, and leading and supervising a team to excel in motor vehicle diagnosis and repair. He also received a coveted the ‘Fixed Right-First-Time’ award with a 100% pass rate. Moving back to Europe, Chris next worked as a team leader at an Audi/VW main dealer in Dublin, Eire. This was a more demanding, more senior role with increased responsibility. As well as his normal day-to-day activities, the role added further responsibilities in team supervision, increasing productivity, quality control of service delivered and target achievement. It was December 2008 when Chris joined Russell Automotive Centre in London as an assistant service manager, as well as continuing to work as a master technician. Once more, he carved out a niche resolving highly-technical issues where others couldn’t. His time at RAC served as a springboard for launching his own business. 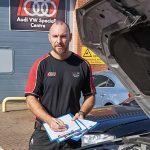 Since then, Chris has capitalised on a hard-earned reputation as a well-known London Audi/VW electrical and electronic problem solver. And of course, there’s his recognised passion and dedication to the motor trade. Chris, who is fluent in Polish and English, lives with his family in North London. When he isn’t servicing and repairing Audi and VW vehicles, he’s a keen Gym member, extreme sport participant, Motocross enthusiast and aspiring yachtsman.